Ahead of Easter chocolate buying I've chosen to feature one of my absolute favourite home grown talents. I have been wanting to write something about Chococo, the artisan chocolatier founded and run by Claire and Andy Burnet, for a while. Their chocolates consistently tempt and please me, and their seasonal shapes and gifts are always absolutely delightful. From their home base in Dorset they run a business so rich in ideas, of such high quality, and with such passion, that it is a delicious example of the kind of chocolate company I set up this website to celebrate and share with others. Claire Burnet has taken the time for an interview, and her words are the best possible insight into what they do and why. I defy anyone not to be pleased with these colourful beauties. 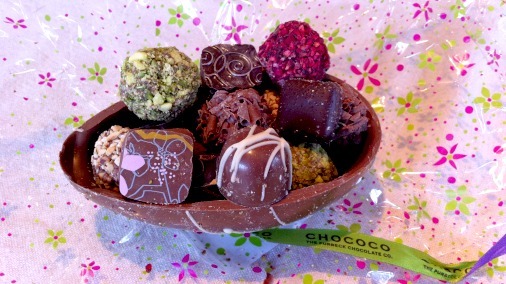 Everything at Chococo is made fresh to order for their online business or to sell daily in their shops. They use local Dorset ingredients wherever possible, and have even been using the same farm in Dorset for the cream in their ganaches since they started eleven years ago! There are always new things to discover, so here are just a few of the things on offer for Easter, to give you a flavour of what they do. Even more charming on the inside. Genius! You can see from the lead picture of this article that their eggs are quite beautiful. As everything is handmade no two pieces are ever the same. What is even more spectacular is what you find on the inside. I have lost count of the number of times I have recommended this Dorset Dinsaur egg to mothers of dino mad kids, and what kid isn’t. 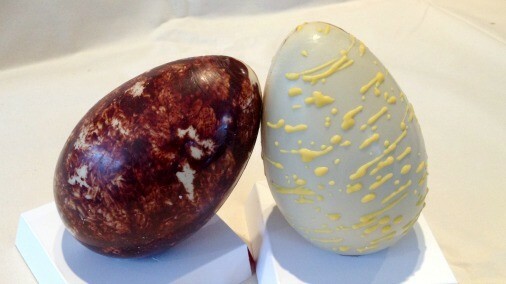 It starts life as the brown speckled egg pictured above, made of a good 43% Venezuelan milk chocolate, and then opens to reveal dinosaurs and fossils of both dark and white chocolate. 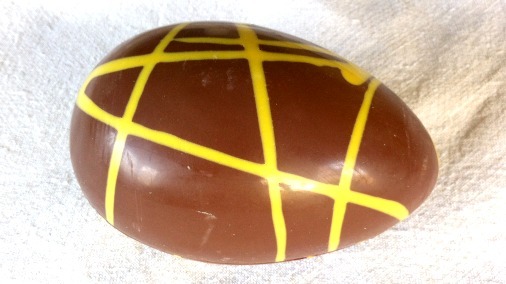 It remains one of the most crowd pleasing and delicious ‘novelty’ eggs I have seen or tasted. This year’s new edition. What will you find inside? 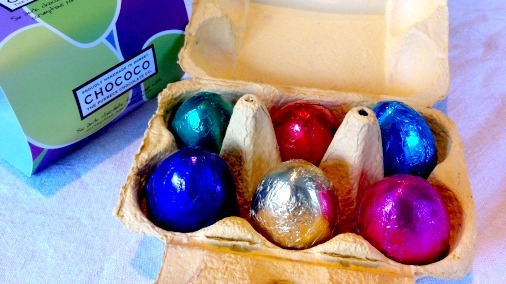 All Chococo’s large eggs have this wonderful discovery of treats inside, whether cute shapes, or tasty additions such as honeycomb, ginger, or a smile-inducing rattle of coloured chocolate beans and a sprinkling of popping candy. This year’s newbie is the Springtime egg, whose exterior tempts with it’s dashing yellow splashes, and whose interior reveals uplifting butterflies and flowers. 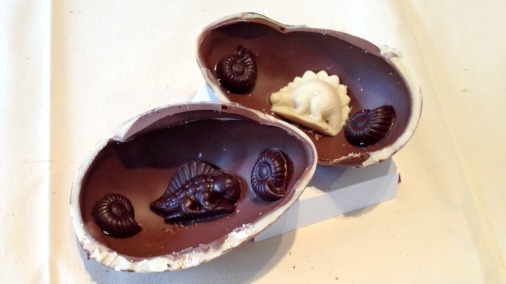 Like the dinosaur egg this one gives the lucky recipient the trio of chocolates to enjoy, milk, dark and white. 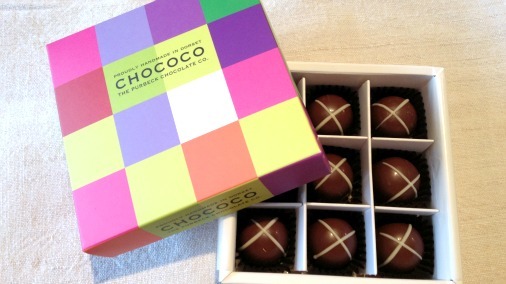 Chococo’s filled chocolates have deservedly won many awards. They are currently Grand Jury finalists in the 2014 European Semi-Finals of The International Chocolate Awards in two categories. Their selection boxes are always full of favourites and intriguing new things. This Easter they have filled a half shell of the 43% Venezuelan with some of these chocolates and then prettily wrapped it with floral cellophane and ribbon. It looked beautiful when it arrived, I would have liked to save it to give it to someone I really wanted to treat. But like all fresh chocolates they needed to be eaten not kept, plus I really owed it to you all to taste and share the experience. Or at least that is my excuse. 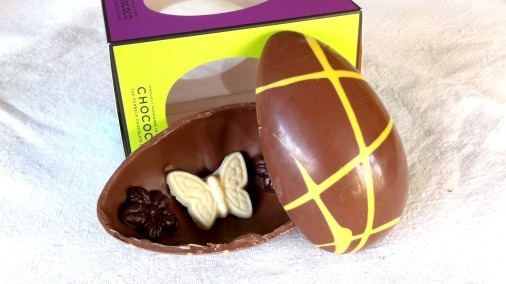 Chococo’s fine filled chocolates, with an Easter twist. Nothing isn’t interesting, full-flavoured and indecently easy to eat. The milk chocolate truffle, with its coating of shaved chocolate, is reminiscent of a Flake, but one made with chocolate well worth eating. Both the passionfruit and blackcurrant chocolates deliver finely made fruit-rich jellies, balanced in flavour and texture by smooth well made ganaches. The passionfruit has the mellow warmth of milk chocolate as it’s partner, whereas the blackcurrant has the more complex and and very well matched zingy dark chocolate couverture. Lemon curd is also well handled, tangy and fresh, but indulgent and without sourness. My favourite was probably the cardamom and pistachio truffle, a vibrant ball of green thanks to the crushed nuts which encase a firm but moussey ganache. It is delicately but indentifiably fragrant with the matching green of very fine cardamom. A crunchy, comforting, well flavoured delight. The interior of the new Chococo shop in Winchester. All of Chococo’s treats are available to order online, and as it is all made to order it is a good idea to do so well in time for Easter, Christmas, Valentines, or whenever you are in need. Especially around the big festivals it is vital in order to be sure they have time to fulfil what you need. If you are near Dorset, you can head down to their shop, where you can also eat a bigger range of treats in the cafe. They also run courses, which is another good present idea. Many of the recipes for the cakes and treats served in the cafe are in Claire’s excellent book. Despite the glut of chocolate books I already had, I have found I really love cooking from this one. My recent production of her Chocolate Praline Pavlova was particularly hard to resist. 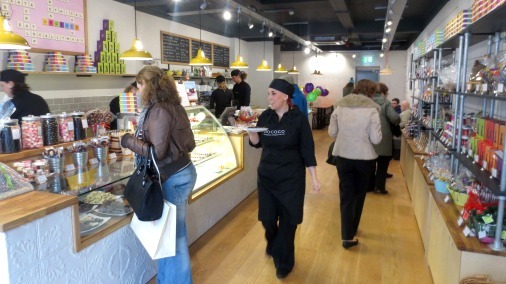 Chococo’s success has seen them open a new shop in Winchester in late 2013, which is already thriving. So if you are in that neck of the woods you are lucky indeed. Hot X Buns, Chococo style. To finish I will leave you with another personal favourite; the combination of two of my favourite things in the whole world that is their hot cross bun chocolates! These are milk chocolates, a milk shell with a flavoured milk ganache. What I love about these is the warm orange fruit notes, baking spices and evidence of dried fruit. They really do evoke a classic fruited bun.